To be honest the upper boundary of the zone when we last published was appallingly thin even for the minimal Y1. In fact, so much so, in hindsight, we probably should have made the zone 25000 all the way up to 26500. The gap up at the open on Monday of 147-points to 26075 made all this irrelevant anyway. 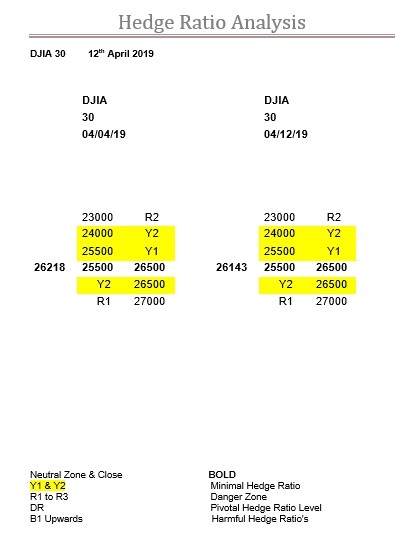 As far as we are concerned 26500 will be the all-important encounter, and if, or when, this happens and the DJX’s reaction, will tell you all you need to know about the remaining week of this expiry. The fact that we have had just one 200-point and one 300-point daily move since the 28th is the bizarre aspect, as with zero ratio, these types of move should be the starting point. Again, whether it is in one direction, or there and back, is neither here or there, it just should be a lot more volatile than it actually is. The potential is certainly there, and from the top of their zone to the bottom is an eye-watering 1000-points don’t forget. The day after our last comment the DJX hit the intraday high, and so far, expiry high, of 26487, or to us the top of its zone. It is worth noting that up to yesterday’s close, 26143, this index has lost 344-points. Apart from this being the top of our trading range, it is also significant because the SPX in that time has only retreated 4.92-points while the NDX has actually advanced 12.99-points. Furthermore, what we said back on the 4th is just as relevant today, and really this index should be seeing 200-point daily moves as a matter of course. Unlike the SPX, here there have been no changes to the ratios, so this makes 26500 still a very significant level. What we always say is please look at all three US indices, as when one hits one of its significant ratio levels it will naturally be affected, but this is magnified when two or all three hit their own levels at the same time.